LAS VEGAS, NV –– March Networks®, a global provider of intelligent video solutions, is pleased to introduce the next evolution of its powerful Searchlight software. Used by leading banks and retail organizations worldwide to extract valuable information on customer service, merchandising, operations, compliance and more, March Networks Searchlight™ helps businesses improve performance and profitability. Integrating clear surveillance video, business data and highly-accurate analytics, the software also enables organizations to proactively detect fraud and theft, and reduce investigation times by as much as 90%. Analyze, compare and share critical information on customer service, operations and more – faster and more conveniently. New summary dashboard views and drill-down filtering. 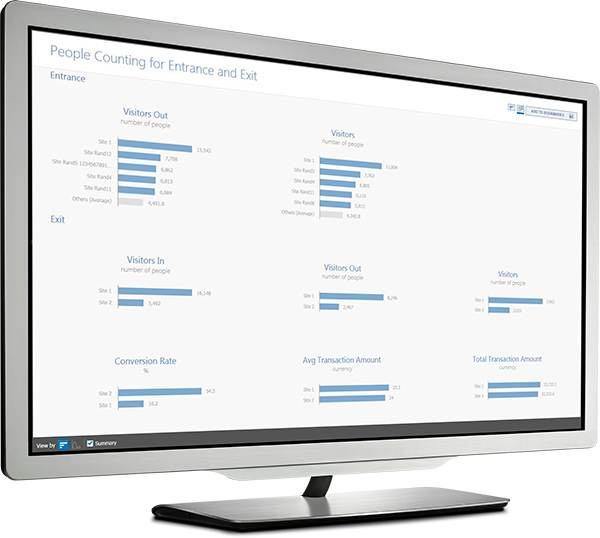 Available in Searchlight’s Business Analytics reporting tool, the new dashboards enable users to compare aggregated data and trends from multiple locations more effectively, based on their own key performance indicators (KPIs). Users can filter data by analytic, site or customized grouping across their organization, and quickly drill-down to a granular level when needed. A retail operations manager, for example, could view people counts from all locations, then drill down to get exact numbers for each of the four entrances at a single site. A district manager could do the same to view the information from his district only. Users can also save their own custom reports and dashboard views for convenience. Multiple image export to email. Another Operations Audit addition, this practical feature makes sharing video images quick and easy. Users simply right-click and select the images they want to export, and the software will automatically add them to the user’s email application as attachments. Other new Searchlight features include the ability to automatically export Business Analytics data from all sites, cameras and zones on a set schedule, ensuring that key reports are always ready and easily accessible. As well, new embedded hyperlinks in the software’s Business Rules Summary email notifications allow users – in particular loss / fraud prevention investigators – to move quickly into the software to view video evidence and the exact exceptions results. March Networks will showcase its new Searchlight business intelligence dashboards and reporting capabilities in Booth 26047 at the ISC West Conference & Exposition, April 11-13, 2018 in Las Vegas, NV. For more information, please visit https://www.marchnetworks.com/isc-west-2018.